Senior Wide Receiver Ryan Umpleby set a school-record with 241 receiving yards against Misericordia. 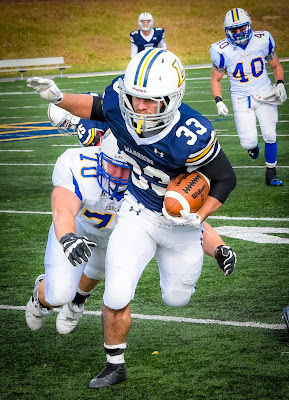 WILLIAMSPORT, Pa. – Senior Ryan Umpleby (Forest Hill, Md./Fallston) capped his career with the Lycoming College football team in fine style, making nine catches for a school-record 241 yards and a score to lead the team to a 38-14 win over Misericordia University in Middle Atlantic Conference action at David Person Field on Saturday, Nov. 14. The Warriors (4-6 overall, 4-5 MAC) racked up 552 yards of total offense, while holding the Cougars to 264. Junior quarterback Chase Whiteman (Gettysburg, Pa./Gettysburg) tossed for 318 yards, the second time in as many weeks that he threw for 300 yards, as he completed 16-of-20 passing and he notched two touchdown passes. Junior Blake Bowman (Valley View, Pa./Tri-Valley) rushed 26 times for 180 yards, finishing the year seventh in school history with 1,150 rushing yards. His 17 rushing touchdowns and 18 scored are both single-season records. The day belonged to Umpleby, though, as he caught four passes for more than 30 yards (48, 55, 30, 51), helping him finish the year with 980 receiving yards, which is fourth in school history. His 1,736 all-purpose yards this year are second in school history and Bowman's 1,493 were sixth. Lycoming got going with its first drive of the game, as it went 75 yards in 10 plays, with Bowman rushing 50 yards on six carries before barreling in from one-yard out. After a pair more stalled Misericordia (1-9 overall, 1-8 MAC) drive, the Warriors got the ball at the 48-yard line near the end of the first quarter and Whiteman found freshman Nick Costello(Havertown, Pa./Haverford) for a 48-yard touchdown pass, as Costello popped it out of a defender's reach for the nice reception. The Warriors got one more score midway through the third quarter, with Whiteman finding Umpleby on a 48-yard score to cap a nine-play, 80-yard drive. The Cougars responded late in the half, with Jeff Puckett finding Juwan Petties-Jackson for a 23-yard score with 1:00 left, but Lycoming took a 24-7 lead into halftime, after Whiteman found Umpleby for a 55-yard completion to set up a 30-yard field goal from sophomore Devon Flynn (Levittown, Pa./Conwell-Egan Catholic) as time expired on the half. In the second half, Lycoming continued to drive and control the clock, as Bowman carried four times for 62 yards during one drive in the third quarter, scoring on a 29-yard run up the middle untouched to make it 31-7. In the fourth quarter, Lycoming added its final score, as Bowman scored from one yard out to cap a six-play, 67-yard drive set up by a 51-yard pass by Umpleby that started the drive. Misericordia got its final score with 3:12 left on a seven-yard score by Puckett, who rushed 20 times for 108 yards in the game. Puckett also completed 10-of-26 for 85 yards passing. 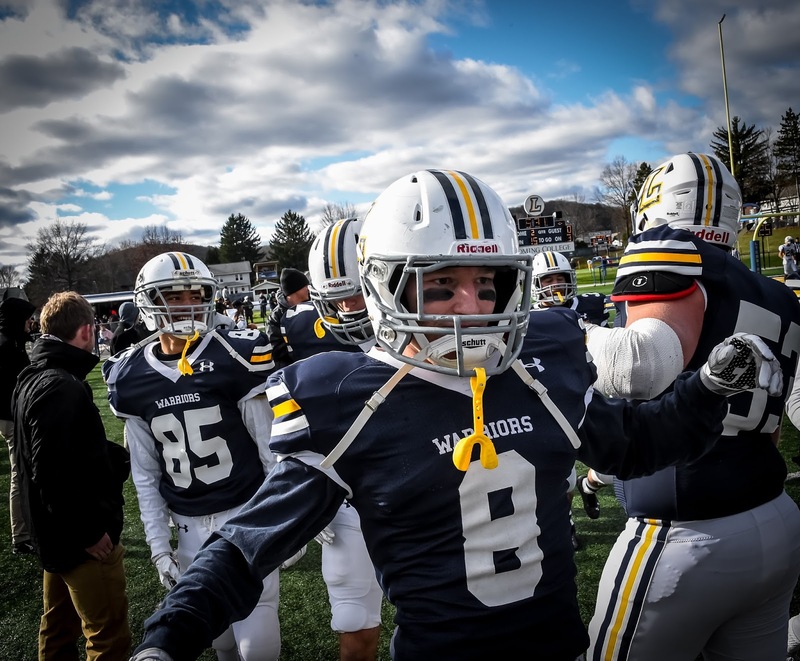 Senior Cole Welham (Lewistown, Pa./Lewistown Area) led the Warriors with six tackles, three for a loss, a breakup and a sack and sophomore Mike Ward (Edgewater, Md./South River) added five stops. Senior Matt Malecki (Stevensville, Md./Kent Island) added an interception and three tackles. Hunter Pates led the Cougars with nine tackles and Anthony Vega notched seven stops and a breakup.